Foliage: evergreen, opposite, oblong to obovate, thick, leathery, 1/2" to 2"
Habitat: Generally found on Nyssa sylvatica in New Jersey, with reports of some on Acer rubrum. One unsubstantiated record of Quercus alba as the host plant exists in NJ. Range in New Jersey: According to Witmer Stone, formerly frequently found through much of the Middle district and occasional on the edge of the Pine barrens, but now nearly exterminated in the State. Monmouth County was the most northern known station for the plant. Misc. 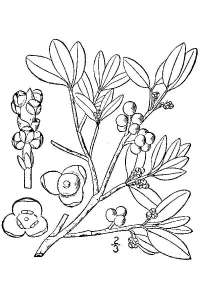 P. leucarpum is a hemiparasite; that is, drawing minerals and water from its host tree, but it retains the ability to produce its own chlorophyll. 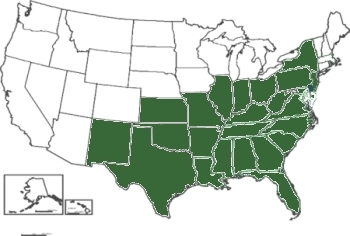 Its host tree varies widely throughout the United States, but in New Jersey is found almost exclusively on Acer rubrum. Its nectar is used by various bees and it is pollinated by various insects including certain ants, flies, and beetles (See USGS link above). Phoradendron means "thief in a tree". 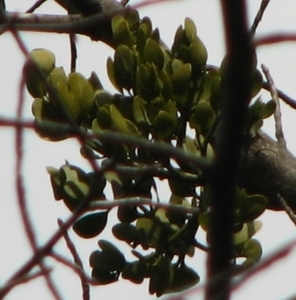 The entymology of "mistletoe" is thought to be German, "mist" or "dung" and "tang", "branch"--literally, "dung on a branch".